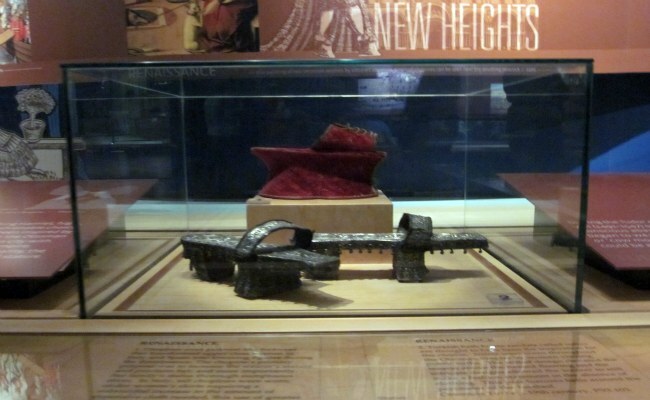 The Bata Shoe Museum is one of its kind museums in Toronto featuring fascinating and enormous collection of footwear. If you are looking for a bit quirky, off-beat and different kind of museum, then this is the place for you. 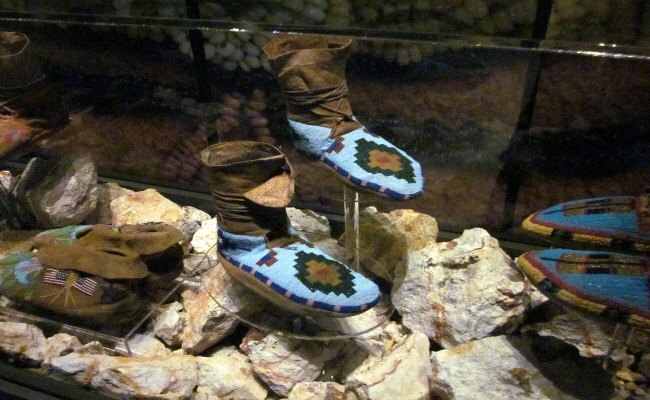 From ancient time to modern shoes, fancy footwear to basic ones, the museum houses an amazing collection of more than 10,000 shoes and footwear-related items from all parts of world spanning over 4,500 years. If you are interested in the history of shoe, you will certainly admire this museum dedicated exclusively to footwear and its history. 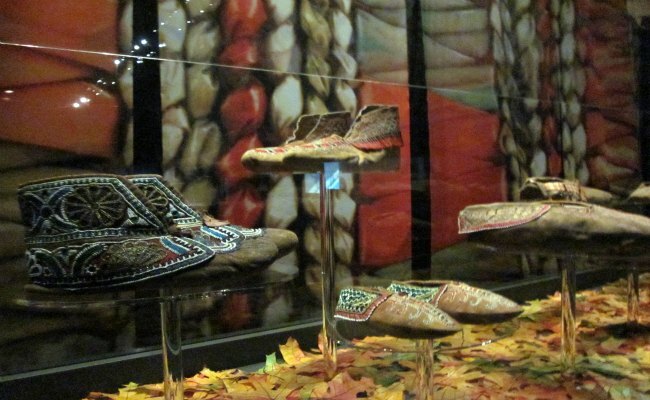 The Bata Shoe Museum is a centre of knowledge and provides awareness and understanding of functions and responsibilities of footwear in the social and cultural life of human race. Conceived by Mrs. Sonja Bata, the Bata Shoe Museum is housed in an eye-catching four storey building designed by architect Raymond Moriyama. Since the 1940's, Sonja Bata has been traveling the world on business and recreation with her husband, Thomas Bata of the Bata Shoe Company. Sonja Bata had a passion for shoes. Consequently, she started collecting different kinds of shoes and related stuff from the various areas she visited. In 1979, she founded the Bata Shoe Museum to find a permanent home for her ever growing collection of shoes. Finally, in 1995, the current museum opened its door to public in the spectacular building which looks like a shoebox from outside. Since its opening, the Bata Shoe Museum has become an unusual attraction in Toronto and entices many visitors from all corners of the world. The Bata Shoe Museum houses the world's biggest and extensive collection of footwear and related objects. The museum consists of four different galleries – one semi-permanent and three temporary. Each one features different exhibits based on a unique theme. 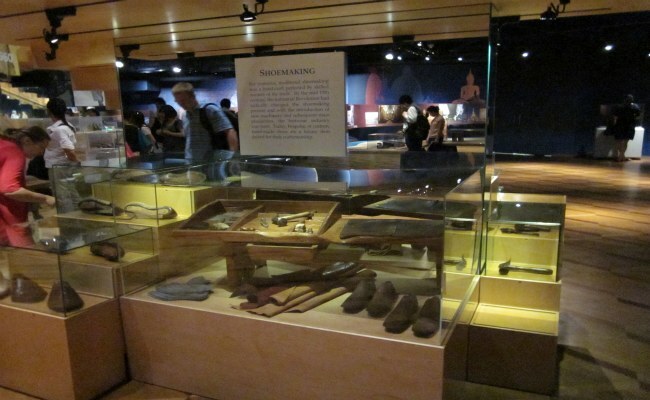 As you explore the exhibits, read the interesting and informative footnotes. 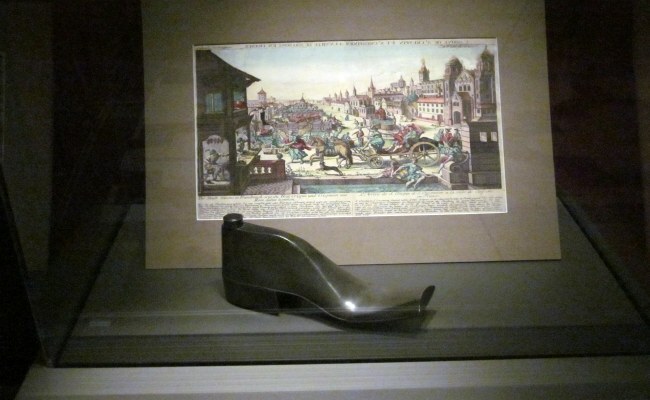 The semi-permanent exhibit, titled 'All About Shoes: Footwear Through the Ages', displays captivating history of footwear through a diverse collection of shoes from different cultures. 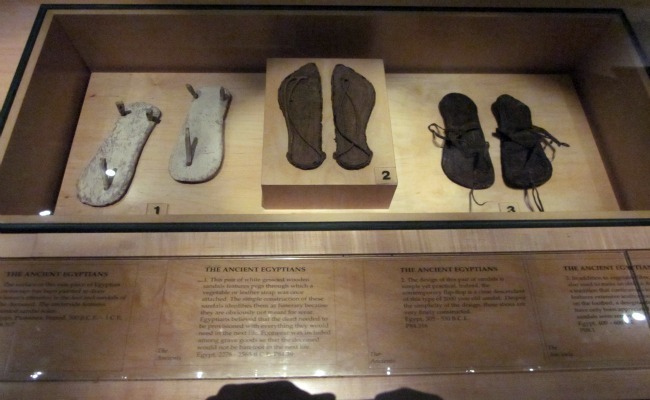 Here you will find shoes from the ancient Egyptian culture and the Romans and Greeks era. There are shoes from India, China, Africa, Europe and North America - almost every part of the world. The museum also features shoes worn by various celebrities. The list includes ballroom slippers worn by Queen Victoria, a Terry Fox running shoe, blue patent loafers worn by Elvis Presley, a boot worn by John Lennon and Marilyn Monroe's red stilettos. The three changing exhibitions are usually on display for short period of one to two years, and may focus on a specific time period, cultural group or geographic area. There are also some interesting stuff other than shoes including original paintings and tools used for shoemaking in ancient time. 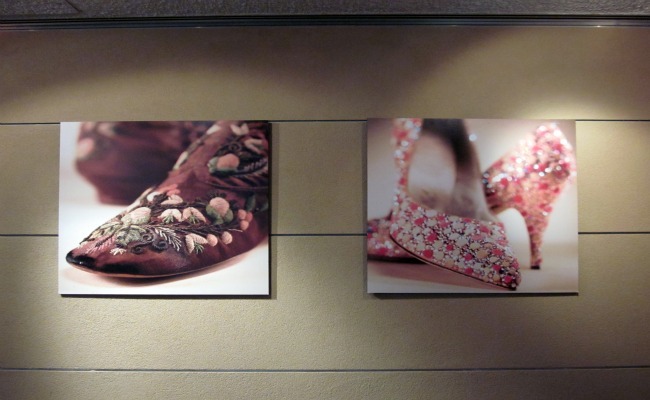 The Bata Shoe Museum is not very big, but surely there is lots of interesting stuff inside the museum. Plan a visit to this unusual museum, a strongly recommended place, especially if you're a shoe lover. The museum is open 363 days a year, except Christmas and Good Friday. Please note that no additional taxes apply to above price. Every Thursday evening between 5 and 8 pm, admission is Pay-what-you-can, with a suggested donation of $5. Tickets are available at the admission's desk. The St. George stop on both the Bloor-Danforth and the Yonge-University lines is closest to the museum. From the St. George station, exit onto St. George Street. Walk south for about 100 metres and the museum is located right on the southwest corner of Bloor Street West and St. George Street. From the West - Take Highway 401 E into Toronto and exit at Avenue Road (Exit 367). Continue south on Avenue Road until you reach Bloor Street West. Then turn right onto Bloor Street and continue west to St. George Street. You will find the museum right on the southwest corner of Bloor Street W. and St. George Street. From the East - Take Highway 401 W into Toronto and exit at Don Valley Parkway. Then take Bloor Street exit and continue on Bloor Street West until you reach St. George Street. The Museum is on the southwest corner of Bloor Street W. and St. George Street. From the South - Take QEW/Gardiner Expressway E into Toronto. Take the Spadina Avenue exit. Continue on Spadina Avenue until you reach the Bloor Street West. Proceed east on Bloor until you reach St. George Street. 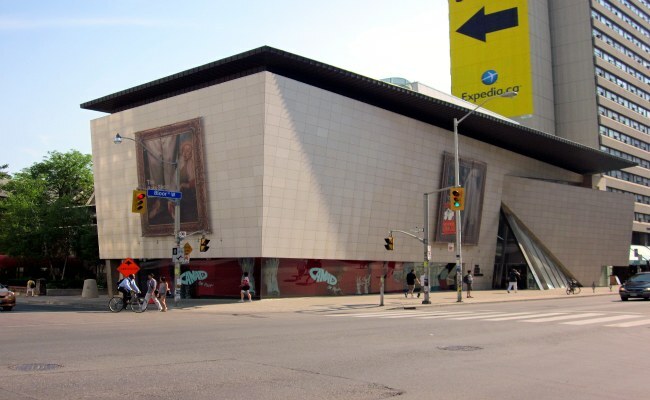 The Bata Shoe Museum is on the southwest corner of Bloor Street W. and St. George Street. From the North - Take Highway 400 into Toronto, exiting onto Highway 401 East. On Highway 401 E, exit at Avenue Road (Exit 367). Continue south on Avenue Road until you reach Bloor Street West. Then turn right onto Bloor Street and continue west to St. George Street. Parking: Street parking and paid parking lots within walking distance of the Museum may be available.